Sandy Hook is the perfect beach spot when you're hoping to get in an epic run on sand, trails or road, and especially if you're hoping to follow it up with a swim and a lazy day (or two) at the beach. Looking for a simple run that has plenty of awesome scenery with water fountains and restrooms along the way? Hoping to find a spot where, after the run, you can hop in the ocean to swim the tired feeling out of your quads? Sandy Hook is the perfect place, with an excellent multi-use bike and pedestrian path, as well as huge swathes of beachfront that are perfect for a more challenging, sandy run. Much of the beach and multi-use path were destroyed by Hurricane Sandy, but the park has recently reopened. The multi-use path is a great spot for a long, flat run, and there’s a view of the harbor on one side and the ocean on the other. You’ll also run through old military dorms and officer’s houses in what looks like a ghost town at the far end of the island. On a stormy day, it’s a little spooky, and definitely makes you run just a little bit faster to get back to the beachy areas. The beach itself gets a bit crowded on the weekends, but it’s not the obnoxious “Jersey Shore” crowded, and you’ll largely avoid the craziness of the beaches slightly south of there. And on the bright side, there are some great food trucks, plus restrooms and plenty of spots to top off your water bottle, as well as take a quick shower after a run, or after a post-run ocean swim. The sand at the top of the beach isn’t ideal for running, unless you’re wearing sneakers. It’s pretty rough on your feet otherwise. But down by the water, it’s a nice, firm silt-y sand that begs to be jogged over. Some rocks make it a bit more technically interesting as well. For those adventure runners craving big miles and technical trails, if you head over the bridge out of Sandy Hook—it has a pedestrian walkway, don’t worry—you can go another mile down the road, make a left, and pop into Hartshorne Park, where you can get in miles of awesome singletrack running before heading back to the beach. Hartshorne has everything a trail runner or mountain biker could ever want, from log hops to roots that make up a hollowed out staircase. It’s badass. If you’re a road runner, though, the Henry Hudson Trail is a mix of paved and dirt multi-use path that you can pick up right near the park. 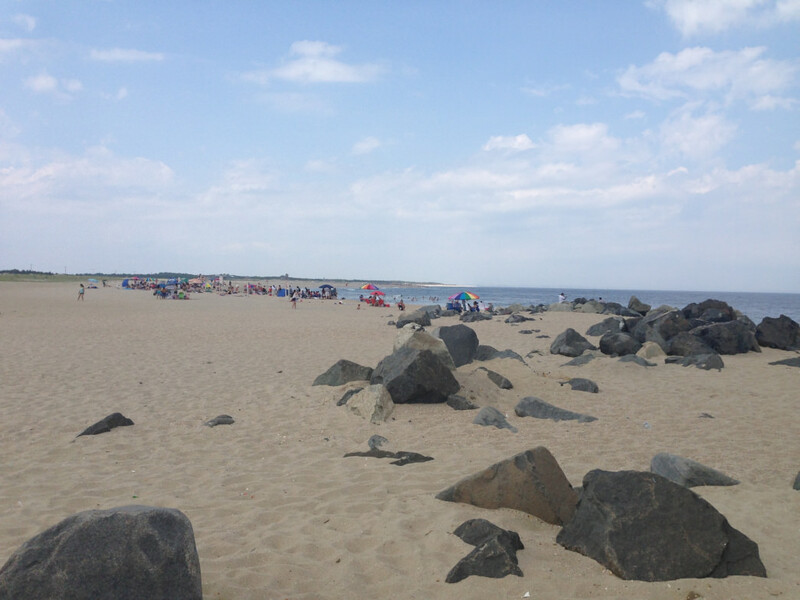 The ferry to Sandy Hook costs $46 round-trip, but it’s worth it if you want to spend a day at the beach after your run, or even make it a weekend-long stay, since there’s camping on Sandy Hook now as well.